DSM-V: Medicalizing the Human Condition? The ongoing revision of the Diagnostic and Statistical Manual of Mental Disorders has provoked prominent psychiatrists to declare that the next version (DSM-V) is in danger of medicalizing normality. Since “normality” covers quite a few people who don’t think of themselves as mentally disordered, I thought it would be important to look into this rather than keep pawing obsessively at the wrapping of my own little human package. There is a powerful social world out there, after all, and it has stamped me, for one, with a numerical code for major depression. That number may not be so ominous as one consigning me to prison, but it’s mine for life in the eyes of that world, no matter how fully recovered I might consider myself to be. The debate about how the revision should be handled clarifies for me the evolution of the DSM and the effects of the present system. I’m interested primarily in getting a handle on the basic approach rather than following details of the major battles. (Go to the excellent Carlat Psychiatry Blog to stay current on the controversy.) The public exchanges among prominent psychiatrists reveal the darker side of current and potential methods for diagnosis and treatment. Whatever the DSM-V revision group may or may not be claiming, Dr. Francis helps a lay person like me understand the basic nature of the DSM system of classification. He points out that the manual relies on descriptive diagnosis, meaning that it labels each set of symptoms as a given mental disorder but without, for the most part, any proven physical basis explaining its cause, or any scientific method of testing for the condition. He argues that there can’t be any great advance in a descriptive system until knowledge of the biology and neuroscience of the brain have advanced far beyond the current state. Many of his criticisms echo the ones that have been made for years about his own handiwork – DSM-IV. Take, for example, the phrase from the title – “mental disorders.” Lacking knowledge of the specific physiological changes giving rise to symptoms, the editors of the DSM decided they couldn’t characterize the conditions they observed as “diseases” – like diabetes or cancer. So they came up with the word “disorder” to cover the conditions they identified. Unfortunately, that word has no precise meaning. According to DSM-IV itself: “…it must be admitted that no definition adequately specifies precise boundaries for the concept of mental disorder.” DSM-V may try to push those boundaries farther out and, in so doing, extend the psychiatric domain over millions of additional people. The reported rates of DSM-V mental disorders would skyrocket, especially since there are many more people at the boundary than those who present with the more severe and clearly “clinical” disorders. The result would be a wholesale imperial medicalization of normality that will trivialize mental disorder and lead to a deluge of unneeded medication treatments – a bonanza for the pharmaceutical industry but at a huge cost to the new false positive “patients” caught in the excessively wide DSM-V net. They will pay a high price in side effects, dollars, and stigma, not to mention the unpredictable impact on insurability, disability, and forensics. (Of course, DSM-IV did quite well at achieving the same result but evidently left a lot of room for growth.) Even worse than the subthreshold disorders, though, is the idea of adding a “pre-psychotic” category. This would be used for anyone thought to be a high risk for later developing a psychotic disorder. What would you call later? A month, a year, 10 years, 20? I can’t imagine the criteria for such a diagnosis, but I suppose it would hardly matter which vague symptoms would need to be observed or what the time projection might be. A psychiatrist would have a frightening power to stigmatize someone for life. There’s plenty of over-medication and involuntary confinement now, but this could trigger the use of such methods without the bother of having to wait for actual symptoms to occur. Dr. Frances’ scenarios may be overdrawn, as defenders of the DSM-V process claim, but this debate brings out issues that predate the current battle and go to the heart of the impact of the DSM on all of us. Dr. Paul Chodoff, writing from his perspective as a practitioner with 50 years of experience at the time, entitled a 2002 editorial, The Medicalization of the Human Condition. Extreme shyness, for example, has gradually been transformed from a personality trait to a medical condition. The screening criteria for major depression have created such a low threshold as to include many states that used to be considered part of the ups and downs of any life. These changes in definition, he argues, have caused the apparent skyrocketing of social phobia and depression. While DSM supporters claim that strict adherence to the prescribed diagnostic procedures would prevent such problems, Chodoff responds that subjective interpretation of checklists can’t get it right all the time. He believes that the early application of DSM principles helped to lift psychiatry out of the days when psychoanalysis was the dominant model, and medical explanations were scorned. But now, he believes, medicalizing psychological conditions has gone too far. People suffering from what he calls “problems of living” should seek psychotherapy alone without medication. But that approach is rarely accepted by insurance companies. They seem to be much happier paying for drugs, despite the soaring costs and ever more common use. What Chodoff urges (and it makes so much sense to me) is that psychiatry and the other helping professions need to accept the reality that their work “transcends” the medical model. It often deals with conditions that are not pathological but still cause a lot of suffering. People need help for many reasons, but they don’t always need medication. The next post will look at a proposed alternative to the DSM diagnostic method that goes beyond changing psychiatric practice to changing how we think of our own lives. What’s your experience with the results of the DSM approach? These days it’s quite common to get multiple diagnoses for each aspect of what troubles us. Has that been helpful to you or has it set you back? I think the most significant recent shift in the development of medicalization is that it is no longer driven by some all-powerful medical elite but on the contrary by ordinary people and their advocacy groups. There is an immense social demand for the medicalization of virtually every aspect of our humanness. In fact, as recent sociology of medicine has pointed out, medicalization is no longer about the medical codification of social problems: positive individual attributes are now also in the process of being coded as medical phenomena. Different styles of learning, for instance, are given medical labels, so that children who are, for instance, exceptionally bright or “well-adjusted” are handed diagnoses of dubious scientific merit. We are entering a new phase of post-modernity in which individuals, deprived of more coherent socially based meanings, find it hard to make sense of their reality without medical labels to tell them who they are and how they are supposed to position themselves in relation to society and other people. As a result people increasingly use psychiatric labeling as a shortcut to self-understanding and identity. Thanks John. Looking forward to the next instalment. I think this is extraordinarily interesting to think about. My problem is with reductionism – so I’m not of the view that only biological counts as a problem. People are social beings and usually want harmonious relationships. If shrinks can help with this (rather than just dispensing pills for a condition – biological or not) then that would be a good thing in my view. There is a long tradition in Western culture, which I value highly, of critiquing our culture. Asserting that it is pathological in some (or many) ways – that normality is indeed sick. In my view mild depression is regarded as normal and I think this should be addressed (but not by drugs – instead by releasing the extraordinary amount of frustration and anger that people feel to bring useful social transformation). My big problem with the medical approach is that it treats people as ‘cases’ – it is the label that is treated and not the person. The various versions of the DSM all do this. There are physical conditions diagnosed with no known biological basis – these are ‘syndromes’. Is the proliferation of categories a problem? The multiplication in the number of ‘fundamental’ sub-atomic particles isn’t usually thought to invalidate nuclear physics, but to show that it is becoming more precise. I think this discussion is enormously important – it can take us right to the heart of psychiatry and how it treats people. This is such a thoughtful comment. I agree especially about people becoming cases and the label becoming the focus of attention rather than the person. The model behind the label can structure the perception of each individual as well. I do believe that the multiplication of categories is a problem when it arises not from new knowledge, but from simply pulling a type of behavior out of the realm of ordinary experience and forcing it into a paradigm of illness. As Allen Frances says, there has to be a great advance in understanding of neuroscience and biology to justify this sort of change. I’ll get the next installment out in a couple of days – your ideas help enormously in focusing my thinking about all this. I can only say that in my youth I was extremely shy, so I was interested when this appeared in your post. It may have transformed into what I consider to be agoraphobia. I have posted about one recent incident in my life. I was also anorexic as a child but there was no name for it then. 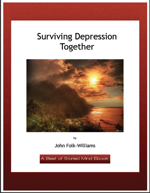 I have suffered from situational depression over the loss of a loved one, or other devastating life experiences. Fortunately for me, it has never been an on-going problem. I do know this: I would rather suffer a physical ailment than to suffer from the dark rooms of depression. It is a sad and misunderstood illness. You have my deepest admiration for the courage you show in bringing this issue to the fore and exploring new evidence and treatments. Try to smile and think of all the geniuses who suffered from this devil and achieved greatness either in spite of it or because of it. May great authors, poets, musicians and painters have left us markers of the creative use of a dire darkness. My thoughts are with you…. It is interesting to think back to a time when we didn’t have clinical names for the difficult things we were going through. When I was a kid, the only phrase I ever heard relating to mental illness was “nervous breakdown.” I had no idea what it meant, but it sounded pretty bad – and nothing I would ever get near. The good thing about naming was that I could begin to see that these conditions didn’t define who I was, and I could then start to deal with each one. I’m so glad to hear that your episodes of depression have been more situational rather than an ongoing problem. I’ll check out that post you mentioned – I think every description that can be shared is helpful to more people than you might think. Thanks so much for your sympathy and kind thoughts. Over the past year, I have been smiling a lot more since I’ve finally been able to move beyond depression.